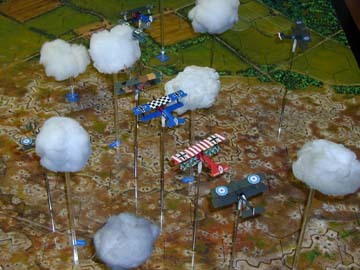 Welcome to the website of Aerodrome® 1.1, the simple and fun table-top game of World War I aerial combat! Aerodrome® 3.0 - Korean War-era Aerial Combat ruleset to be published soon! WHAT ARE AERODROME® 1.1, 2.0 and 3.0? Aerodrome® 1.1 is a simple, easy-to-learn, fun-to-play table-top game of aerial combat in World War I. With simple yet elegant rules, players "fly" colorful models of WWI aircraft, using wooden "cockpit" control panels to determine maneuvers and telescoping poles to simulate multiple altitude levels, and each side attempts to shoot down the aircraft of the other side. A perennial favorite at conventions, hundreds of convention attendees, club members and individuals have enjoyed playing Aerodrome® 1.1 since 1994; the game is played by groups around the U.S., as well as in England, France, Italy, Greece, Australia, Hong Kong, and Brazil. Aerodrome® 1.1 has won numerous awards, both in the U.S. and England. Aerodrome® 2.0 - available now - is the adaptation of the 1.1 ruleset to World War 2 aerial combat. The ruleset takes into account the increased speeds and maneuverability of WW2-era aircraft, as well as the greater increased lethality of their weapons; in addition to dogfighting rules, it also includes rules for level bombing, dive bombing, torpedo bombing, antiaircaft fire, air-naval combat and much more, all with a framework that remains easy to learn and is fast and fun to play. Aerodrome® 3.0 - to be published soon - expands the 2.0 ruleset to Korean War-era aerial combat, from the end of WW2 up to (but not including) the advent of air-to-air guided missiles. WHERE CAN I PLAY AERODROME® 1.1? At home, at a convention, at a store, at a club. Aerodrome® 1.1 is a game, not a complex simulation; it's simple enough that you can learn to play, on your own, from the rules (although you will need other equipment to play in addition to the rules!). Copies of the Aerodrome® 1.1 rules, as well as other equipment for playing Aerodome® 1.1, may be ordered directly from Aerodrome® Aerial Combat Games (email: aerodromeinfo@gmail.com) or from a number of vendors, including RLBPS Miniatures and Coopers Creations; please click on their links below for more information, or send an email to aerodromeinfo@gmail.com. 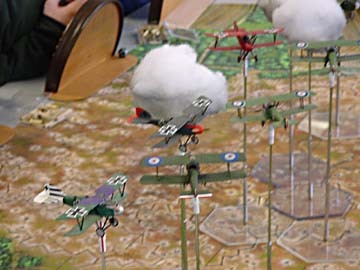 However, Aerodrome® 1.1 is also played at numerous historical miniature games conventions around the U.S. (as well as by a number of clubs and gaming groups), at which you would be welcomed as a new Aerodrome® 1.1 player. For additional conventions and other places to play Aerodrome® 1.1 and/or Aerodrome® 2.0, see the "Where To Play" page.